The rain was coming down steadily after a huge downpour at 5.00 am and I was anxiously looking upwards hoping that things would improve and by the time I arrived at The Growling Swan the rain had almost stopped. I was expecting my phone to be running hot with either cancellations or “are we still going” but only one of the 24 starters rang to check the situation and to their credit everyone showed up as keen as ever and with much faith in the fickle Pattaya weather. We welcomed back Rita Zoebelli, Jerry Dobbs from Queensland, Australia and Peter Bye back for some more R & R from his work at the North West Shelf off Western Australia. Michael Catillon, Kae (Hole in One) & Brendan Byrne. We departed the GS a couple of minutes ahead of our scheduled 8.30 am departure, arriving at the course just after a few van loads of golfers from another golfing outlet. The weather was fine by now but it was obvious there had been some heavy rain falling shortly before our arrival and we arrived at the first tee to find 6 groups waiting to tee off ahead of us. There was nothing we could do but wait as three previous groups had to wait for the heavy rain to stop and we finally got our first four-ball away 25 minutes behind schedule at 10.25 am. At least it was fine and not too hot with the golf course looking good, although obviously quite wet under foot at times but as carts were not allowed on the fairways winter rules through the greens were allowed. The areas in front of some of the greens are recovering very well and the greens were generally in fine condition and at times very quick, which is more than can be said for the 6 groups ahead of us. We crawled around the front nine in two hours and twenty minutes and the pace did not improve throughout the round which was completed in four hours and forty five minutes, our longest round of golf for a long time but at least we played and never saw a drop of rain. We were able to have 2 grades with five podium spots in each. A Grade was for handicaps 0 to 20 & B Grade for 21 and over. We had nearest the pins on all the par threes and longest first putts on 9 and 18 which were collectively sponsored by The Growling Swan, Lindsay Fry, Peter Bye, Sandy Leiper, Mozart Bronze and one golfer who wished to remain anonymous. Many thanks to these golfers for their generosity. 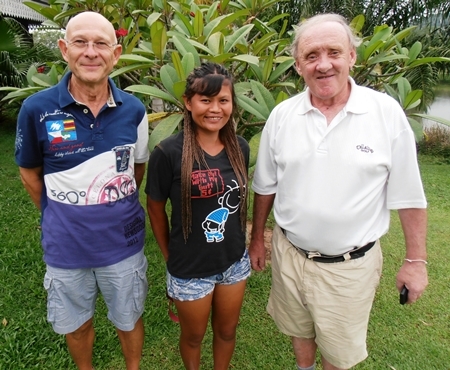 The highlight of the day was a hole in one on the seventh by Duangjai “Kae” Tusagad who has been playing with us for quite some time with her partner Roy “Plums” Dayton and everyone was delighted with her success. The winner of A Grade with 39 points was Michael Catillon, 1 point ahead of the colorful Bjarne Kjaer in second place. Lindsay Fry came third with 36 points and Mike Allidi was fourth with 35 points, 1 ahead of yours truly in fifth spot. Having his first win with us was Brendan “Casper” Byrne who won the B Grade section with a fine 38 points from Roy “Plums” Dayton in second place with 37 points. A count back was required to determine third & fourth and it was Sandy “Leiperfrog” Leiper (20 point back nine) just beating Max “Two Corsets” Bracegirdle (17 point back nine) with both finishing with 34 points. There were 3 golfers on 31 points all vying for fifth spot and it was Rita Zoebelli (17 point back nine) who rounded off the podium from Jerry Dobbs (16 point back nine) and Kae (13 point back nine). The Growling Swan NAGA Award (awarded to the golfer who has the worst score on the day) was won by Wendy Bernek and she accepted the award in fine spirit. Back at The Growling Swan afterwards Kae insisted on ringing the bell as part of her hole in one celebration and her partner Roy was in agreeance even though he ended up paying for it, of course. It was impossible to remove the smile from Kae’s face for the best part of an hour and she still had it as she climbed on the back of Roy’s motor bike when they departed. This was our first hole in one at Growling Swan Golf and after his first golf lesson earlier in the day, mine host Peter Grey declared that he would be the second – we will see my friend! It was a beautiful, sunny Pattaya morning as we assembled at The Growling Swan in readiness for the trip to the popular Mountain Shadow Golf Course. We had our best ever field of 33 golfers which included several returnees and a couple of newcomers plus two groups of infamous “Growling Swan Delinquents”. 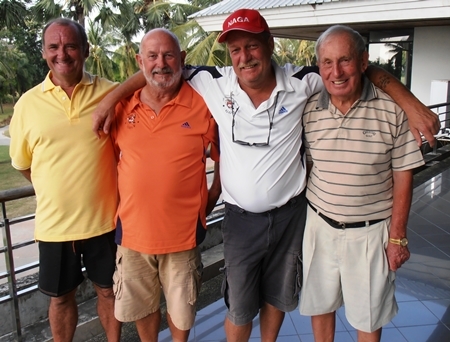 Sandy Leiper, Max Bracegirdle, Scott Leszcynski & Don Richardson. We welcomed back Irishman Don Richardson, Tony “Spaggoni” Olcorn from Brisbane, Australia, Paul “Muncha” Moloney from his drilling job in Ghana, Kevin Waycott after a couple of weeks in Geraldton, Western Australia, Kevin Grosse from Melbourne & Wes Rado from Perth, Australia. It was also time to farewell Ron Gillettt who is returning to Melbourne on the weekend. Also a very special congratulations to Jim Bell who became Daddy to a baby boy a couple of weeks ago. We had 3 mini vans booked which were “chocka block” and we departed the GS five minutes earlier than scheduled at 8.25 am and took the Highway 3 route for a change which got us to the course 45 minutes later. The course was fairly quiet and we only had to wait for one group to tee off before we were able to send our first group away, a three ball at 9.45 am which was 15 minutes ahead of our booked tee time. With 9 groups we were expecting a slow day but this was not to be the case as things moved along at a very good pace. The weather was fantastic and the golf course was in superb condition with no sign of water on the fairways although the dams & lakes were very full. The greens were back to their slick best and I for one fell into the trap several times of being above the hole which resulted in the inevitable three putts. This golf course is in the best condition we have seen it in for many a year and it is a credit to the Greenkeeper and his staff. As mentioned earlier we moved along at a cracking pace and completed the front nine in a tad over two hours. It became hotter during the back nine but a quick drink stop before the thirteenth tee revived us and we managed to complete the full round in just over four hours. It was a very enjoyable round of golf with great company at a first class venue. We were able to have 3 grades with five podium spots in each. A Grade was for handicaps 0 to 16, B Grade for 17 to 28 & C Grade for 29 and over. We had nearest the pins on all the par threes and longest first putts on 9 and 18 which were collectively sponsored by The Growling Swan, Sportscene, Ken Bernek, Jerry Dobbs, Tony Olcorn & Paul Moloney. Many thanks to these golfers for their generosity. The winner of A Grade with an excellent 41 points was veteran Don Richardson with one of his playing partners Mike “Hunter” Gosden 3 points further back in second place. In third place came J J Harney with 34 points, 1 point ahead of Lindsay Fry in fourth spot & Jim Bell fifth on 32 points. Max “Two Corsets” Bracegirdle had the best score on the day and won the B Grade with 42 points, 7 points clear of Graham “Grunter” Buckingham in second place with Tom “TC” Cotton third on 32 points. Fourth place went to Brendan “Casper” Byrne with 31 points and Roy “Plums” Dayton finished fifth with 29 points. Sandy “Leiperfrog” Leiper had his first ever win and finished on top of the C Grade with 34 points, 2 points in front of Fred Dineley in second spot. In a count back on 30 points for third & fourth spots it was Tony “Spaggoni” Olcorn (18 point back nine) just edging out Kae (14 point back nine) who finished fourth and Paul “Muncha” Moloney rounded off the podium in fifth place with 26 points. The Growling Swan NAGA Award was won by Scott Leszcynski and he accepted the award in fine spirit, wearing the cap for a couple of hours. Deefa the Dog was of course in attendance and collected many donations to charity from our ever generous Growling Swan crew.